Striking 19th century manuscript school-girl map of Persia. 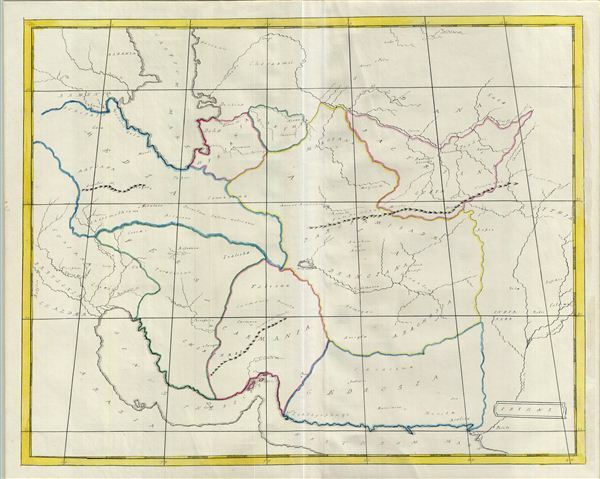 An unusual and beautiful 1823 manuscript map of Persia and Afghanistan (Iran) in antiquity. The map generally follows the historical atlas work of the english cartographer James Wyld however is a fully independent and unique hand rendered production. The manuscript geographical data and detail throughout is altogether outstanding and completed in a fine hand adept at decorative text and the rendering of rivers and mountains. This map covers from the Caspian Sea to the Arabian Sea and from Iraq and Babylon westward as far as the valley of the Indus River. The map is divided and color coded according to territories and kingdoms of the Hellenistic Period. An altogether unique and wonderful one of a kind find. James Wyld I (1790 - 1836) and his son James Wyld II (1812 - 1887) were the principles of English mapmaking dynasty active in London during much of the 19th century. The elder Wyld was a map publisher under William Faden and did considerable work on the Ordinance Survey. On Faden's retirement, Wyld took over Faden's workshop acquiring many of his plates. Wyld's work can often be distinguished from his son's maps through his imprint, which he signed as "Successor to Faden". Following in his father's footsteps the younger Wyld joined the Royal Cartographical Society in 1830 at the tender age of 18. When his father died in 1836, James Wyld II was prepared to fully take over and expand his father's considerable cartographic enterprise. Like his father and Faden, Wyld II held the title of official Geographer to the Crown, in this case, Queen Victoria. Among his first major decisions was to move operations from William Faden's old office at Charing Cross East to a new larger space at 475 Strand. Wyld II also chose to remove Faden's name from all of his updated map plates. Wyld II continued to update and republish both his father's work and the work of William Faden well into the late 1880s. One of Wyld's most eccentric and notable achievements is his 1851 construction of a globe 19 meters in diameter in the heart of Leicester Square, London. In the 1840s Wyld also embarked upon a political career, being elected to parliament in 1847 and again in 1857. He died in 1887 following a prolific and distinguished career. Very Good. Manuscript map. Original centerfold.